This page includes Book Review columns from the 2001 issues of Across the Fence Post. Wayne Youngblood is the author of this book subtitled "An illustrated encyclopedia of philatelic terms." It has an attractive soft cover and is a convenient size (6 inches by 9 inches). The format is an alphabetic arrangement of philatelic terms. The print is easily read and photographs are clear and illustrative. The book is derived from a column written by the author that appears in Stamp Collector. The column continues to run and will provide material for future editions of this book. In the introduction, the author describes some of the changes that have occurred and continue to occur in the terminology of philately as technology changes. He states, "Although this book is not a complete listing of all philatelic terms, it does contain most of those you will encounter on a regular basis." How complete is this glossary? As a test, I used the book as I read a study of the Americana series of U.S. stamps. The following terms encountered in the first paragraph of the study were explained in the glossary: series, definitive, postal stationery, decimal denominated, precancel, cinderella, errors, intaglio, invert. There were no philatelic terms that were not found. Most experienced collectors are probably conversant with these terms. The paragraph on stamp production used the following words: web-fed press, sheet-fed press, Cottrell press, B press, Giori system, Andreotti gravure press, Huck press, A press. Only Giori and Huck were not found in the alphabetic list but Huck Corp. was named in the description of the Cottrell press. This list of terms may not be as familiar to even more experienced collectors and illustrate the useful-ness of this glossary. Many of the philatelic terms in this book are well known by the experienced collectors, but there are a number of definitions that even the experts may not have known. Although not an expert, I have collected stamps for over 60 years. Terms such as "adson" (New Zealand stamps of 1893 printed with advertisements on their backs), "battone" (a type of paper), "facer canceller" (a type of machine that turns all envelopes the same direction and cancels the stamps with the use of phosphorescent tagging) are a few that were new to me. The now famous term "chad" is defined as "The technical term given to the little bits of paper punched out during the perforating process." No political reference is used. This glossary is a useful adjunct to collecting that will serve beginning collectors and those with more experience and knowledge. Knowledge about our hobby is to be encouraged and this book will help. I developed an early interest in polar philately and began collecting Australian Antarctic stamps in the mid-1970s. That interest expanded to Australian stamps about four years ago. So when 1 learned that Krause Publications had released the Krause-Minkus Standard Catalog of Australia Stamps, I had to take a look to see how this new catalog compared to the Australia listings in the venerable Scott Standard Postage Stamp Catalogue. The attractively designed cover of the Krause catalog contains a number of bulleted claims, the first of which is that it "Covers all commonly collected issues." As I moved back and forth from Krause to Scott, I found a high degree of correspondence between the two catalogs. What seemed the only significant difference was the absence of Australian states - New South Wales, Victoria, Queensland, South Australia, Western Australia, and Tasmania - in the Krause listing. Scott precedes the Australia listing with the states, whereas the Krause volume simply acknowledges their existence. The Krause catalog also announces that it contains "Completely updated pricing information." Here, I found some interesting comparisons. Krause indicates that their prices are for very fine stamps in either mint never hinged or used condition. Scott prices most of its pre-1945 listings in both hinged and never hinged condition. The 1913 Kangaroo and Map issue provides at least one surprising difference in pricing. The Krause catalog lists the 2-pound rose and black "Roo" (Krause/Minkus 64) at $1920 mint and $390 used. Scott's price for the same stamp (Scott 15) is mint hinged $2250 and used $1550 - no never hinged value is listed in Scott though the other stamps in this issue are priced at roughly double the value of hinged copies. Since I don't have deep enough pockets to buy this classic issue, I'm not sure which authority to believe. One thing I don't believe is the Krause claim that the catalog has "Large, sharp photos." The stamp images are slightly smaller than their Scott counterparts and seem to me to be significantly less sharp. That said, Krause does illustrate each stamp in a set or series whereas Scott provides an illustration of only the base value for many recently issued sets. Overprints, surcharges, and die types seem to be more clearly illustrated in the new Krause catalog. 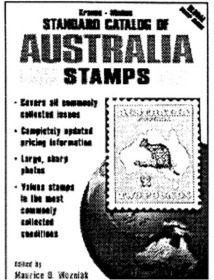 The last bullet on the Krause-Minkus Standard Catalog of Australia Stamps may suggest a contradiction in its overall pricing scheme. At the bottom of the front cover, the catalog claims it "Values stamps in the most commonly collected conditions." Given the discrepancy in value between Krause and Scott in mint never hinged condition for pre-1945 stamps, I suspect that the announcement in its Introduction that stamps are priced in very fine, never hinged condition is inaccurate. I hope a future edition of the catalog will straighten out this confusion. At $14.95, the Krause catalog offers a concise and compact alternative to the bulky Scott Volume 1. Additionally, the last page of Krause offers a Minkus-Scott crossreference; a useful tool should you like to move back and forth from one catalog to the other. If you collect Australia, the new Krause publication will serve as a useful tool to help the collector identify those stamps from Down Under. The fourth edition (2001) of the Krause-Minkus Standard Catalog of U. S. Stamps is expanded, improved, and is written, according to editor Maurice Wozniak, "to help you enjoy stamp collecting." When I reviewed the first edition (1998), I was concerned at the length of time U.S. collectors had been without a Minkus catalog - the last having been published in the late 1980s. With only the Scott catalog to use, its numbering system could become so firmly entrenched in the minds of philatelists that a competing numbering system and catalog would be a tough barrier to break. Although I don't see dealers and collectors rushing to change their numbering system to align themselves with the Minkus catalog, I am pleased that the catalog has become a tool worthy of shelf space. Each subsequent edition has shown that Krause Publications (through its catalog) is willing to grow, change, and most importantly, listen to its dealer and collector base. The newest edition has over 8,000 issues listed and priced. This includes the provisionals and stamps issued by U.S. territories. 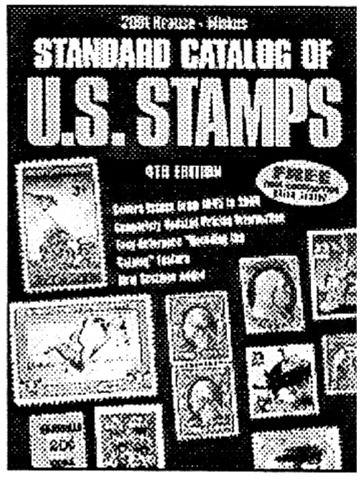 One feature that I had always admired about the original Minkus catalog (and the reason it stayed on my shelf all those "dry" years) was the stories that accompany the stamps and their subjects. The catalog also points out some interesting no-so-obvious facts such as the 1995 Marilyn Monroe stamps having corner perforations in the shape of a star, or that the Wisconsin Statehood stamp contains a hidden image of a badger visible only with a U.S. Postal Service decoder, or that tagging on the American Glass issue is in selective-cut blocks only on the glass items in the stamps. (As an aside, I noted that not all of the issues containing hidden images are so identified.) Collectors will also appreciate the warning after the 2000 Space Achievement and Exploration issue that the foil hologram is affixed with water-soluble gum and may release from the stamp while soaking. There is some new information in the 2001 edition. The technical section on stamp printing processes includes an explanation on how holograph stamps are produced. There are also new sections on stamps that were used as money, postal notes, postmasters' provisionals of the Confederate State of America, as well as test stamps and test booklets. I like the direction this 720-page catalog is heading. It includes a lot of helpful information with each listing plus an easy-reference "De-coding the Catalog" feature. I like the ease on my eyes - two columns, type size and font that are easy to read, and plenty of white space. I like that this catalog is produced right here in Wisconsin; it makes me proud. This catalog deserves space on your philatelic bookshelf. Krause Publications has recently released its second edition of the Standard Catalog of Canadian & United Nations Stamps. I like its 8'/z-by-ll-inch size format with some 350+ pages, which makes it somewhat easier to carry around than larger volumes. Furthermore, when opened, it has a better tendency to lay flat than many other catalogs I have used. 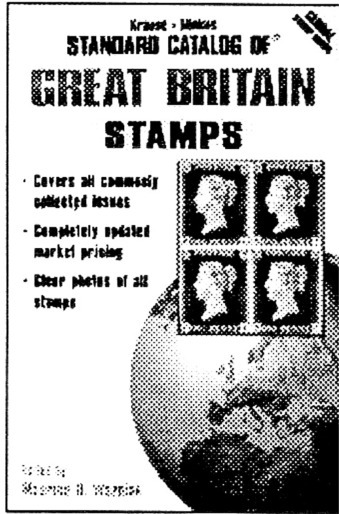 I also like the numerous black-and-white photos of the stamps. The public relations sheet that came with the catalog stated that there are more than 2,500 photos and detailed drawings, and I believe it! The photos are crisp, showing great detail and the printing overall is quite easy to read and not too small. So far, so good! As with most Krause publications, the introductory section provides some useful information on the basics of stamp printing, condition of stamps, and tips on how to use the catalog to its fullest extent. To help overcome the lack of "accepted" catalog numbers, the publisher includes a card at the back of the catalog that the buyer can use to send for a free Minkus/Scott cross-reference guide. Something that could be handy to have. Pricing of the stamps for the United Nations and the post-1920s issues of Canada are generally relegated to the most collected grades of condition - never hinged very fine and very fine used. The earlier issues of Canada (pence to 1859s) are graded mint unused fine and then light-hinged very fine from the Large Queen issue to the War issue. The used are graded fine for most issues up to the end of the Admiral period, then very fine onwards. The United Nations section is some 160 pages and is rather well done. It is broken down into New York, Geneva, and Austria, with- additional sections of postal stationery for each. Singles, plate blocks, and first-day covers are priced. The names of the desigrters/arcisis and printers are given, as well as much story-behind-the-stamp information. Being the WFSC's resident Canadian, I looked forward to seeing how Krause would handle the Canadian section. It consists of 160 pages plus an additional 27 pages for the provinces. It is important to remember that this is a standard catalog and not a specialized volume. This means that it does not go into great depth in certain areas such as the early stamps, which are listed with the basic issues only. The Large and Small Queens and Admiral issues are done this way. There is a mention or two of the various printings but unlike specialized catalogs, not into any great depth. The modern issues - post-1930s - are done quite well. Crisp pictures, a fair bit of information on the various issues, and other details make it easy for the collector to use and appreciate. There are some minor problems. Unlike the United Nations section, the Canadian section does not price plate/ inscription blocks nor FDCs. This would be a tedious job for the early issues of Canada and I can see why it was not done. Almost all post-1960 issues, however, could be done without a major effort and use of space. At the least, I'd like to see prices for some of the more pricey issues or those that are known to be better as inscription blocks, such as the 1989 Infantry Regiment issue. This particular inscription block is definitely better than four times the single price! I would also urge the buyer to make use of the free cross-reference for Minkus/Scott numbers that the publisher will provide. The more numerous definitive and back-of-the-book issues of Canada are sometimes confusing when listed in chronological order. A novice collector not familiar with other catalogs may not notice this, but for collectors used to "groupings" as done by other catalog publishers, it takes some time to acclimate to this catalog's listing format. Overall, I like this catalog. 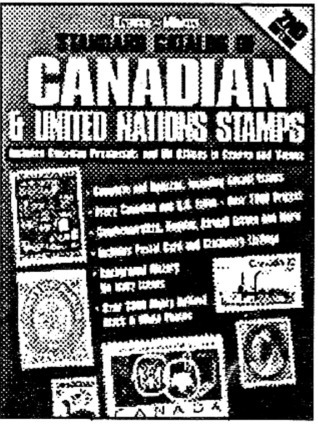 It is a nice addition that most collectors of basic Canada and United Nations stamps will enjoy and appreciate. A Review of the Krause-Minkus Standard Catalog of Great Britain Stamps, Edited by Maurice D. Wozniak, pp. 412, issued 2001. Collectors to identify, organize, and price their collections have long used stamp catalogs. This new entry into the field which covers the stamps of Great Britain, Northern Ireland, Scotland, Wales, Alderney, Guernsey, Jersey, and the Isle of Man deserves some consideration. In keeping with other volumes in the series, the volume is a 6-by-9-inch, soft-cover book with a glue-back binding. Its size makes it easy to hold in the hand for casual browsing but poses some difficulty should the collector want it to remain open when placed on a flat surface. Print quality is generally good, though some of the illustrations could be a bit sharper. Entries are organized and numbered in Minkus fashion by date of issue regardless of type of stamp: definitives, commemoratives, semipostals, officials, and postage dues are intermixed. Unfortunately, the date of issue for each entry only contains the year of issue. Without the month and day, it is not possible to use this catalog to identify a first-day cover. The entries are all illustrated, including all members of se-tenant issues. This is a very nice feature for the catalog browser. 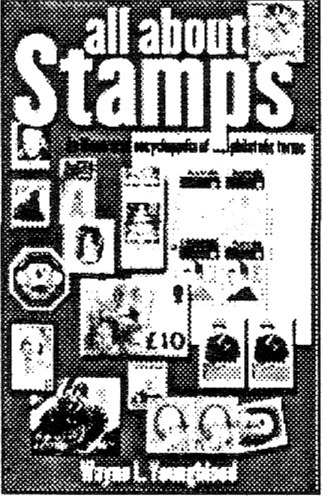 Some of the illustrations for early issues, however, are of canceled stamps, which interfere with design identification. Listing the year of issue, title, type of stamp, perforation, and watermark formats the entries themselves. This is followed by the illustration and then completed by listing number, denomination, color, mint price, and used price. As the entries are closely spaced, there is some visual confusion identifying where an entry starts and ends. A better arrangement might be to start with the illustration and have all text relating to the issue appear beneath. Major color, perforation, and watermark variants are listed. Booklet panes are also listed. Prestige booklets, a popular collecting area, however, do not appear in the catalog. There are also no individual listings for individual plate numbers for early issues. In addition, there is also no indication that se-tenant issues are in fact se-tenant issues, let alone whether they were issued in blocks, strips, or panes. This is unfortunate for anyone hoping to use the catalog to lay out an album page. As an aside, the system used in this catalog for identifying watermarks is simply and wonderfully elegant. Each watermark is clearly illustrated in conjunction with the issue in which it was first used. The watermark number is the same as the number of that issue. This makes it incredibly quick and easy to locate any watermark. Other catalog makers would do very well to adopt this method of organizing watermarks. Pricing in catalogs is always a hit-and-miss affair. A stamp tends to be worth what it will cost to purchase it from another collector or dealer. There is no indication in the catalog of how prices were established, i.e., which dealers or price lists were consulted. As such, they may not be a particularly useful guide except where relative value is considered. In conclusion, this catalog of the stamps of Great Britain is a decent general reference for the casual collector and is a nice volume for the browser who happens to be using a Minkus album. If you're looking for a detailed catalog that will help you order stamps from dealers, however, this may not be the volume you're looking for.